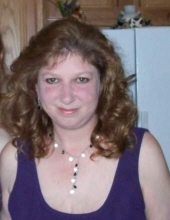 Pamela Sue Cornelius, 47 years, of Maddensville, PA passed away on Sunday, December 2, 2018 at the Milton S. Hershey Medical Center with her family by her side. She was born on Tuesday, May 11, 1971 in McConnellsburg, PA, the daughter of John and Deloris (Cromwell) Mills. Pam was a graduate of Southern Huntingdon County High School in 1989. She married Kenneth A. Cornelius on August 12, 1989. Pam was a homemaker. Pam is survived by her husband, Kenneth A. Cornelius, her two children, Nicole E. Shotts of Three Springs, PA and Ashlynn M. Cornelius of Red Lion, PA, and two grandchildren, Jordan and Toryn Shotts. A visitation will be held on Friday, December 14, 2018 from 5-7 p.m. with a short memorial service to follow at the Kelso-Cornelius Funeral Home at 322 North Second Street McConnellsburg, PA 17233. Online condolences may be expressed at www.kelso-corneliusfuneralhome.com. In lieu of flowers, we ask that you please make a donation to the Milton S. Hershey Medical Center or your choice of cancer foundation. To send flowers or a remembrance gift to the family of Pam Sue Cornelius, please visit our Tribute Store. "Email Address" would like to share the life celebration of Pam Sue Cornelius. Click on the "link" to go to share a favorite memory or leave a condolence message for the family.